While watching a documentary on tv news some days ago, I felt like doing a spread for the events and the renovation of Ground Zero in New York. The Sun associated to the Letter (the cut of the spread): represents the upcoming “anniversary” of the event. And the amount of publications that are going to be written: 10 years already and like many people, I do remember that day just like yesterday. It is one of those moments that one remembers all his life. I was going back to my hotel; I was staying at the Reunion’s Island at that time, when I heard the news on the radio. I spent the evening watching the news with other clients of the hotel, including someone who used to be a journalist. We would talk and stare at that TV, wondering what the world was turning into. One of my friends who actually was a New York resident send me later a photograph that he took from the top of his building where he could watch the event taking place. He wrote me that he saw the tower collapse. Without a doubt, that day he woke up to live the worst nightmare of his life. I still have a little tourist book of NY in which I checked all the places I wanted to see in the city, including of course, the Twin Towers. Fact is, in September I had a last minute change and instead of going to NY, I had to go the Reunion’s island for work. Someone must have been watching over me. What could possibly better represents ground zero than the Mountain? Everything is cement and block of concrete there and has to be rebuilt. At the crown of the layout we have the Garden. So we go literally from a block of concrete made by nature, to complete scenery made by man. Architecture by the way is well represented within the layout as the combo of Pisces and Garden. Bear is standing next to it, and represents the amount of money which is tremendous. Bear, by itself represents money. Pisces placed like this, close the Bear, augments the amount of money. And the lady, (one must consider here the ace of spades on the card), illustrates the contract to rebuild the place. The Dog, the Bear, and the Book: in a layout, 3 ten represents an important change. The 2 Kings stand for a new enterprise and the house on the right is the big buildings. The garden is considered by many as being a very good card, when you don’t take note of the cartomancy aspect of the card: the 8 of spades. Some readers only care about the picture and ignore the traditional meaning of the card. In this particular layout, one has to take care of the traditional meaning. 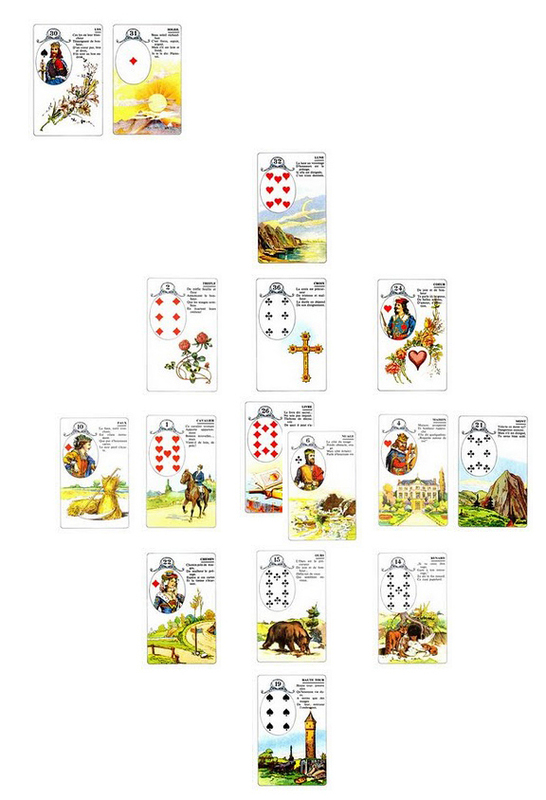 The Garden is actually the 8 of spades as you can see in the picture of the spread, and it is at the top, crowing the whole set atop the snake. The 8 of spades has a very bad reputation and despite the fact that the Garden might also represent a public place, here it should be taken into account especially if the Snake is present, and it is: just below the Garden as a matter of fact. Traditionally, the Garden and the Snake associated with one another when studying if a place is spiritually clean is a warning sign of entities present. Not that I am so surprised in this case considering the amount of pain that must be floating over there. Mice in itself is a bad card, which I always see in case of stress, suicide, death, health problems, every kind of “deterioration” you can think about … Along with the Garden and the Snake, it is enclosing the layout, sort of making a parameter around it ! The Storks is a good card to notice there in the layout standing over the Scythe : the change taking place is positive and should, with time, take away the negativity over there : the Scythe “cutting” the Mice. It is like a cleansing process, and it will be taking place bit by bit like the Clover is indicating, being at the center of the layout. Hope this analysis was interesting to you. And my deepest thoughts to all people affected by this event. This spread was done with the current situation in New York in mind, the hurricane “Irene” hitting the city right now. The following text is an excerpt from the book currently written about the little Lenormand Oracle. The first part of the book presents the theory of the cards and the way to place the cards within the layout. The second part explains several readings with the breakdown of the cards, explaining how to read the message within the cards, and how they interact with each other. Center of the layout : the card representing the topic of the reading, in this case : the Book. The book stands for the “secret”. Around this card, 13 cards placed in a very specific order. (see the book for further explanation, live classes are also given : www.sigrid-de-kerac.com). Left of the layout : the Scythe and the Rider. The violent side of the event is clearly represented by this combo. Scythe stands for something violent, possibly invasive and sudden and coupled with the Rider, shows the coming of the hurricane about to hit the coast. Above the book at the center, the Clouds ! The Clouds is the perfect card to represent the current event, and the worries that it brings. Clouds stands for bad weather, and also all the trouble coming along with it. you have something like this : a lot of trouble/rain/worries that are coming forcefully (bear) in the city (tower). From the sky down to earth ! 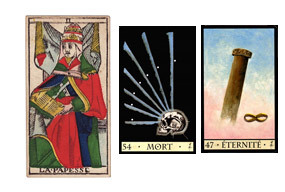 And interestingly enough, the card linking the two aspect of the weather (clouds and moon) is the cross which is most of the time, a sign of burden ! The two cards crowning the layout are thus the Moon and the Clouds showing the weather aspect of the situation upon which human have no control. Hopefully Clover and Heart are around the cross, so this reading is not like the one done for Fukushima (nuclear problem in Japan after the earthquake), and these two cards are some kind of “protection” but do not erase the problems, of course. Hope everything goes well in New York which I love so much ! Hi everyone, seems there is a lot of visits around this time on my blog. I have been busy putting my own website together lately, it is only in French but later on there will be an English version.And of course, it is about my work as a tarot reader and astrologer. I have been waiting 20 years to turn out pro, been doing readings for free all that time. I got now enough feedback and experience, to go out there and assert myself as a professional tarot reader. 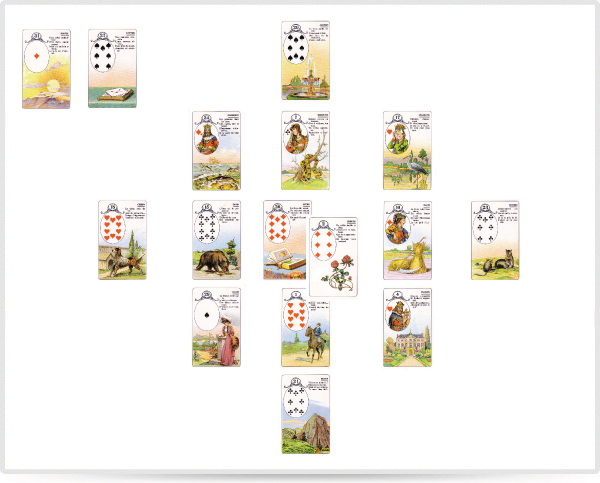 I have also a page on Facebook about the Lenormand. Her name was Patricia Bouchon and she disappeared an early morning as she was doing her usual jogging. I was thinking yesterday night about that reading, and tonight the news is on French TV. She has been found, and unfortunately she has been killed. She was apparently found by a hunter who was looking for his dog, and saw the body. She was a few miles from the place where she disappeared. The body was hidden under a little bridge in the village. A sort of vaulted tunnel under a road according to source. Ah well … lesson learned ! And I don’t practice with the pendulum for long enough to count on that anyway … if I needed a proof of that, I have it ! but on the right side !!! Come on !!! Seems obvious right ? It is what I call an answer by the book ! Clear as crystal water, but I don’t know … I wasn’t 100% sure ! Probably because, I was afraid to let my own opinion go in the way. Before doing the spread, I was like : okay Colin is going to have it anyway .. This said, James Franco had good cards as well …. This will be subject of another post, as I will do the breakdown of the cards. Still, I was happy with the result : Natalie Portman had it and “Toy Story 3” as well. Memo to self : look better at what you have right in front of your nose, and leave the pendulum for now !